Doug was inspired to start weightlifting at the age of 62 when the World Masters Games was scheduled to be held in Edmonton (2005). Although Doug did not qualify for the World Masters Games in 2005, He has since travelled to a number of international competitions and currently holds the American Masters clean & jerk record (82 kg) in the mens 70-74 age group 77kg weight class. When Doug isn't training at the gym, he enjoys biking and skiing (downhill and cross country). Darryl was introduced to weightlifting in 2007 through bobsledding. 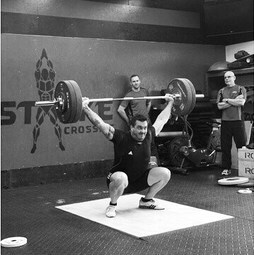 He enjoys the constant pursuit of perfection in weightlifting that is driven by his personal efforts to meet his goals. Darryl's drive has led him to competing on many national and international platforms, including; Canadian Western Championships, Commonwealth Games, Pan American Championships and the 2015 Pan Am Games. Darryl also enjoys spending time with his nieces and nephews and tending to his vegetable garden. Marc began lifting as part of his off season training for volleyball as part of the University of Winnipeg Wesmen Team (4 Years). Marc quickly grew to love the presence of a constant stream of short-term goals, one kilo at a time, which ultimately helped (and continues to help) Marc work towards his long-term goals in lifting. In his downtime, Marc enjoys yoga and eating. Kristin started lifting when she found herself looking for a more physically challenging gym routine. After Kristin experienced her first lifting session, every muscle hurt and only half of what she learnt made sense but, she was hooked. Kristin enjoys the constant challenge of controlling muscle movements and building confidence with heavier weights. Aside from weightlifting, Kristin also enjoys riding her horse, Spanky. Matt switched from being a typical "gym rat" to weightlifting in 2013. Since then, Matt has worked on increasing his strength and mobility in an effort to shake the nicknamed dubbed upon him by his fellow lifters, "Tin-Man". When Matt's not in the gym, he likes to fish, curl and golf like any red-blooded Canadian man. Chuck was first introduced to weightlifting in 2012 while participating in coach Terry’s adult fitness class. After watching the London 2012 Olympics, he decided he wanted to give the sport a try and has not looked back since. Chuck enjoys the challenge of always improving his technique and lifting heavier weights and hopes to participate in the Canadian Masters Championships in the near future. Aside from weightlifting, Chuck enjoy spending time with his wife and 2 kids, playing hockey in the winter and riding his bike in the summer. A busy mom of two, Chris started learning the olympic lifts at age 32. She loves the way the sport constantly challenges her physical and mental strength, as well as her self confidence. When Chris isn't lifting, she is known to bake up a storm. She also enjoys spending time at the lake with her family and friends. Craig was first introduced to Olympic weightlifting through CrossFit. After a few years, he decided to make the switch and focus primarily on weightlifting as a competitive Masters athlete. While Craig enjoys the challenge of developing consistency and tailoring individual technique, he lives for walking out onto the platform and pushing his limits. When not in the gym, Craig can usually be found having a heated light sabre battle with his son Lucas. Craig is the 2016 Canadian Masters Nationals silver medalist. Patrick started weightlifting after first training as a powerlifter. Weightlifting looked like much more fun, so he gave it a try. A year later, he still thinks weightlifting is more fun than powerlifting and he enjoys the challenge that it brings him in every training session. When Patrick isn't training at the gym, he spends time golfing, farming and studying for law school.​​. ​Gil switched from body building to weightlifting after watching weight lifting videos online. He could not resist giving the sport a try after watching lifters, like Klokov, throw incredible amounts of weight over their head! Gil's favourite thing about weightlifting is the challenging process for making each lift successful and the rewarding feeling when he hits his personal goals. Outside of weightlifting, Gil enjoy spending time with family and friends and travelling. Charlene (Char) began weightlifting in 1987 when she finished her first year as a basketball player with the University of Manitoba Bisons. Char was looking for an athlete development coach to assist her in improving her athletic performance. This is how Char meet coach, Terry . . . and the rest is history (including marrying Coach Terry and having 2 kids). Char has been competitively weightlifting for 2 years. Outside of weightlifting, Char loves Women’s Tackle Football. She has played competitively in Manitoba for 8 years and is a former member of the Canadian National Women’s Tack Football Team (silver medalist at the 2010 World Championships in Sweden).